What is Ear Reflex Points, or Synergistic Kinesiology? It is very similar to acupuncture and has been developed by a number of doctors, chiropractors, and acupuncturists in the US. Kinesiology is a new branch of science and includes ways of muscle testing. Muscle testing is a way to ask your body 'yes' or 'no' questions and to follow intuition in those patterns. 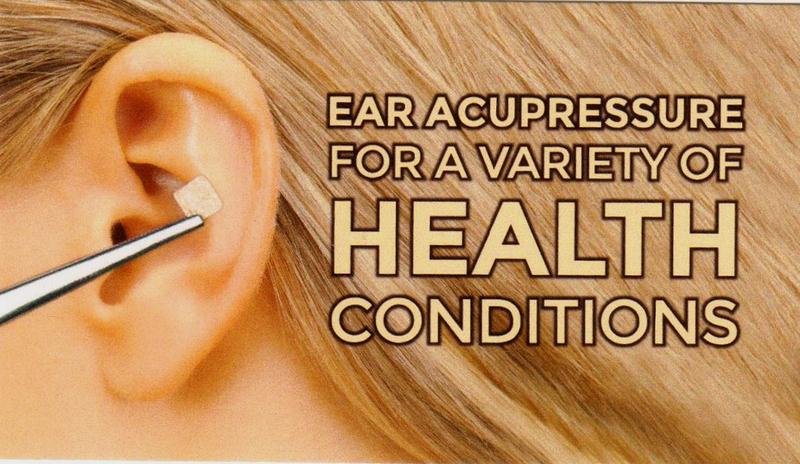 Think of having acupuncture on certain spots on your ears to help release toxins and muscle tension. It's similar, but instead they use little tiny patches to apply pressure on suggested reflex points in ones ears to ease a number of conditions and issues. Pain, chronic migraines, weight loss, quitting smoking, back pain, shoulder pain, nausea, facial paralysis, tennis elbow, sciatica, peripheral neuropathy, arthritis pain, allergies, addictions, dry mouth, PTSD, depression, stress, brain fog, sleeping disorders, fatigue, ADD, erectile dysfunction, smoking withdraw+ more! It's Fast, Pain Free, and Very Effective! Look for the coupons at our two SOHAI locations!